Description: Transfer job, Low Yard to High Yard running under the Brdige #3 approach over the Little Kanawha River. The former B&O "High Bridge" over the Ohio River is in the background. The shot is from Ft. Boreman Park. 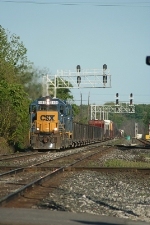 Description: CSX GP40-2 6460 trails on J765 South. Description: Southbound local pops out of tunnel at Vasper. NS mainline runs overhead! Title: CSX 6460 is the brains of the outfit.